Jubilation Lee discovered her ability to create plasma "fireworks" while living at the mall. An orphan, she followed the X-Men home, and saved Wolverine, becoming his friend and later an X-Man. This is our third Jubilee Minimate, but definitely the first to look like this. In 1991's Uncanny X-Men #273, the team adopted the classic blue-and-yellow costumes, giving them a unified look for the first time since 1967. It also marked the point where Jubes was recognized as an official member of the team, and not just a hanger-on. Since the costumes were drawn by Jim Lee, she's got superfluous straps around her wrists, thighs and the top of the boots. The colors are vibrant, though the yellow on the shoulders and shins is a little thin. There's also a little paint transfer on the gloves and feet, but that may vary from figure to figure. 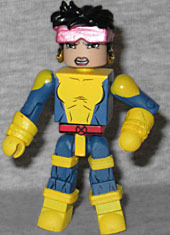 Unlike the first Jubilee Minimate, which reused some Iron Man hair, this one gets a piece that's unique to her. It's black and spiky, and features her bright pink glasses and her London Underground earrings. In fact, we get two hair pieces: one with the glasses pushed up, and one with them covering her eyes. Way cool! She's also got purple flame effects on her hands, which are also reused. Although blind, Irene Adler could see the future with accuracy, making the precognitive mutant a valuable asset to Mystique's Brotherhood, despite her lack of offensive powers. If you think the name "Irene Adler" sounds familiar, you're not wrong: the comics never came right out and said it, but it seems that Chris Claremont intended her to be the same woman from the Sherlock Holmes story - apparently an extended lifespan came along with the precognition. 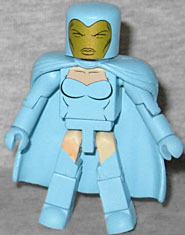 She wears a light blue costume that looks like a swimsuit with opera gloves, a cape, and a golden mask. Since she's blind, the mask doesn't need eye holes - it's still painted with eye-shapes here, though they're the same gold as the rest of the face. Her weapon of choice was a crossbow, because she could accurately predict where her target would be when the bolt got to them. There's a Minimate crossbow in the Walking Dead line, but it wasn't included here. You can remove her mask (it's just painted on a full-head cap, and thus the hood isn't quite as bulbous as it was in the comics) and replace it with a new piece of light gray hair. Her eyes are blank white, and all the wrinkles painted on her face make it look significantly older than the rest of her body - Ben Franklin was right!